This article was written by Clyde A. Harbin, THE BASSMAN, a long time ago around 1976. Clyde never had it published, well at least until now. He has sent me his article on "The Water Walkin' Blade" and given me permission to put it on my website. At first glance of the article, I was immediately intrigued by this typewritten story on CAH Enterprise letterhead. This article was written long before the modern day of home computers. On the typewriter Clyde used, the letter (t) was chipped and the bottom of all the t's were missing. What really made this story unique is he repaired every (t) with a fine point pen. I only wish I could recreate the broken (t) for you but that is not possible. Just imagine if that old typewriter could talk the interesting stories it could tell. Here is one of them. The Mid-South outdoor readers ought to know of the many devious methods or ways that the more enterprising bass fishermen used to "doctor bass lures". There's hardly a lure on the market which cannot be changed to become a "dishonest" bait. In fact, you can be in the other end of the boat and not know your ole' trusted fishing buddy is either putting you on and or putting it to you when he's catchin' bass and you are not. If so, you better ask him for the lure that's on the end of his line. Most likely, that's the only way the real facts will surface. Then, after you get the lure, let him demonstrate how he's fishin' it. This is a positive position to take. Some of these jokers delight in having some fun at your expense....especially if you are five or six bass behind. Then, on the other hand, there's the other type of bass fishermen who will not tell the truth under any circumstances. It is amazing how honest businessmen become something else when asked to reveal their own bass secrets on lures and their sacred fishing holes. It is not this articles purpose to peddle lures to you. But, when bass producing adaption; which appeals to an ole' top-water bass fisherman like me; comes my way, I like to pass it on....so be my quest and read on. On June 1, 1975 Clyde Arthur Harbin Sr., the Whitehaven ice cream mix manufacturer, originator of the Bassmen Consultants and founder of the Bas-Tek-Neke Seminars got together with Charles C. Lewis, one of the Bassmen instructors and also a Cross Bar Expert of South Central Bell. While waitin' for their wives (Polk Harbin and Marge Lewis, both better than average bass fisherpersons) to cook them breakfast at Clyde's East Lake cabin, they got out blank spinner baits (wires not formed or twisted) along with beads, swivels, skirts, o-rings, spinner blades, Uncle Josh #11 Frog Pork, needle nose and round nose pliers and the main adaption part ....the big double bladed Water Walkin' Blade. This 1980 blade was manufactured for Clyde from an adaptation of an original hand-made pattern (now in his antique lure collection) for such blades. 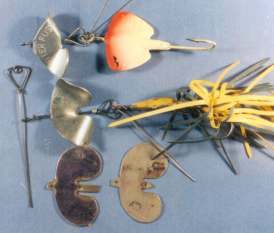 About 1939, while at the Memphis Fisher Aircraft Co., the late Hank Werner; a lure representative for the Fred Arbogast Company, hand cut and formed the originals. 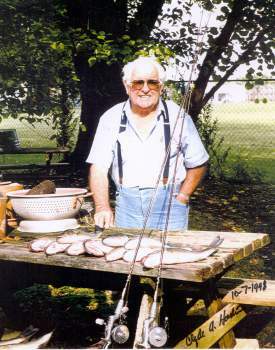 Hank fished the Memphis area lakes with Frank Vestal Sr., Bill Day, Russell Brewer, J.P. Ledbetter, Russell Williams and others during the heydays of paddlin', silk lines, three foot leaders, thumin' reels (no free spools) and even using their fingers to level wind the line, while fishing from small wooden boats. The story goes that Hank and his buddies needed something to fish with, other than the Hawaiian #2 Wiggler, in the lily pads for the big bass in Horseshoe Lake located just out of Hughes, Arkansas. Russell Williams gave the original Werner patterns to Jim Kerwin and on Aug. 23,1979 Jim retired them to Clyde's lure collection. Now, for a little background history on this surface disturber the "Water Walkin' Blade". 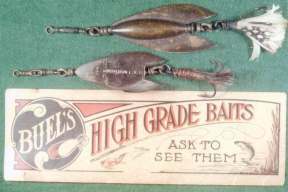 There is little doubt that, in 1848, Julio T. Buel was inspired by desire for action, color, flash, commotion, noise, racket, splash and agitation when he designed the famous Buel Spinner, the first of all manufactured artificial bass lures. These Buel spinners, back then and today (if you are lucky enough to possess one) were used in "doddle-socking" from the end of a stout cane pole with the line half-hitched the full length of the pole. To this date, those with weak hearts should not attempt this method of taking bass. Even the two pounders will almost break your arm and explode you out of the boat. However, this is now a lost art which started fading away after the bait casting rods and reels became popular around the 1900's. Even today, an almost complete copy of the Buel spinner is the Go-Devil. Other adaptations are the Sputter-Fuss, Sputterbug, Dedly Dudly, Little Jewell and the Water Walkin' spinner bait by Clyde. Center Row - Russell Williams hand made lure with an original Hank Werner aircraft metal blade. Bottom Row - Two original Hank Werner aircraft metal blades as a gift from Jim Kerwin. Clyde's blade can be installed to your present Strike King, Bushwacker, Vibra King, Hog Rustler, Lunker Hunter, Forked Devil, Zorro, Bain and other spinner baits if the wire, which holds the end spinner, is long enough. Carefully remove the spinner blade assembly. Straighten out the wire loop. One-half inch above the line eyelet (either twisted wire of safety pin type) bend the wire with a needle nose pliers until it is parallel with the lead head and hook shank. Install two red beads and a hollow metal bead then the Water Walkin' Blade and place another hollow metal bead after the Water Walkin' Blade. A Fred Arbogast, Sputter Fuss or Sputter Bug blade can be used as a substitute blade. Reform the original wire loop. 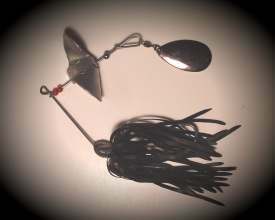 Now, at this point you have a choice of the size and type spinner blade to complete the lure. However, it is suggested that either a nickel or brass #4 Willow leaf spinner blade be assembled to an o-ring which has a barrel or Sampo ball bearing swivel. On closing, be most careful not to collapse the loop. For maximum flash, keep blades polished with Brasso. Depending on rod, line, reel and expertise, a common marketplace one-quarter to three-eighth ounce weight spinner bait is recommended for this conversion. The heavier the lure the more difficult it is to get the lure on top of the water. The skirt should be reversed and the hook dressed with a #11 Uncle Josh Pork Frog or equal (trimmed on a slant to the hook hole) which will make the lure come up and stay on the surface with less effort even at a slower retrieval speed. By doing this you have now added action, color and appearance which will excite the bass. The most effective way to fish this spinner bait adaption is to cast beyond the bass spot and retrieve on top of the water, maintaining constant splashing and water disturbance. Do this five to seven times in the same path....no strike, repeat the same cast pattern and run the lure as a spinner bait buzzin' just under the surface of the water often referred to as humpin the water or making a wake. Now, this style can be repeated any number of times. If this is a known bass hole, drop it down one or two feet or even deeper and run it as a spinner bait. In one way or another this method can be a terrific fish caller-upper. Still no strike? Just as well to repeat operation "first cast" to just test out the bass again. Do this just in case the bass are counting. Again....no strike, just as well move on and let your backseat fishin' buddy put the famous "Git Away Lick" (developed by Clyde) on the hole. Oh sure, some big bass can count and they might say "if that Water Walkin' Blade comes across the top of my kitchen the 19th time", he's gonna try to load up on it. Now you know that the backseat buddy, on leaving, has a different angle to cast at the spot. The number of casts and/or the angle just may be the triggering act that causes the strike!! You just might as well adjust your thinking that all top water strikes are not hooking strikes. Just be careful not to tell your backseat buddy to cast to the "missed strike spot" because you've just located a bass for him. This lure is definitely weedless. However, it should be cast towards the shoreline and be working before getting to weeds, Lily pads, or submerged tree tops, brush, moss beds, coontail moss, logs and stumps. Or, just fish Clyde's adaption when or where other baits fail to operate. This kind of weedlessness is especially important to fishing any cover. Raising the rod tip high enough to make it walk on the water as a slow surface disturber is suggested. Clyde A. Harbin Sr. (left) and Charles C. Lewis (right) caught these nice bass with Clyde's Water Walkin' bait and his Spinner Baits. 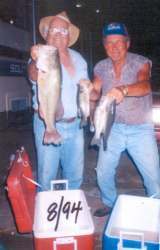 They were fishing Maddox Bay out of Holly Grove, Arkansas a lake just below East Lake where Clyde has his Cabin. Charles Lewis and Clyde Harbin ran Charlie's trot line in Maddox bay. 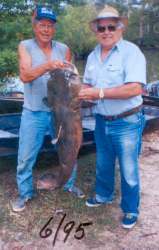 Clyde had to take hold of Charlie's belt to help pull him and the 52 pound Catfish into the flat bottom aluminum boat. Clyde and his wife caught this nice bunch of largemouth bass on October 5, 1998 out of East Lake near the town of Holly Grove, Arkansas. Clyde used his Water Walker bait and Mrs. Harbin used his Spinner bait lure. All the bass on the table top were between 18 and 19 inches. ....Wow what a catch this is !! !